Home » Ryan Reynolds Blondie Bars! 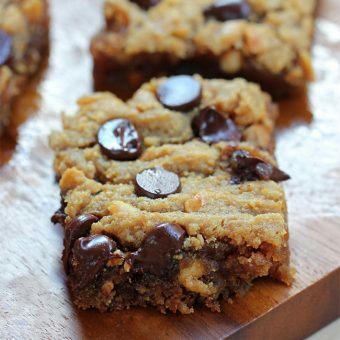 Classic soft and gooey blondie bars, with chocolate chips in every bite – just the way a blondie should be! You’re wondering about the title. It’s really my friend’s fault. When I brought the blondies to a party on Friday night and people were going crazy for them, she said it was clear the blondies had seductive powers. This sparked a conversation over other things with seductive powers… and soon the blondies were being compared to hot fudge sundaes, Tollhouse cookie dough, Ben & Jerry’s, George Clooney, and Ryan Reynolds. 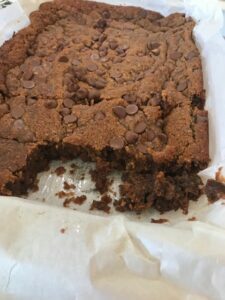 I was told that if I ever posted the recipe on the blog, I had to call then Ryan Reynolds blondies. 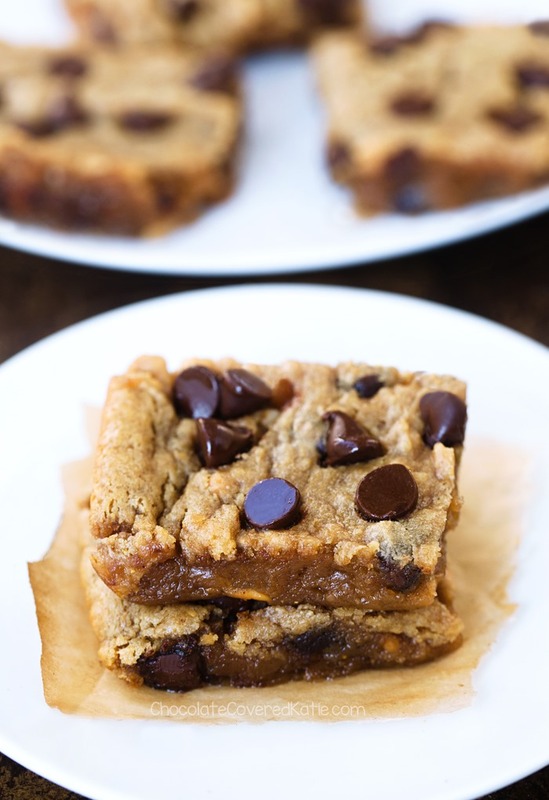 Unlike Ryan Reynolds, these chocolate chip blondies are not married… meaning you can keep them all to yourself. 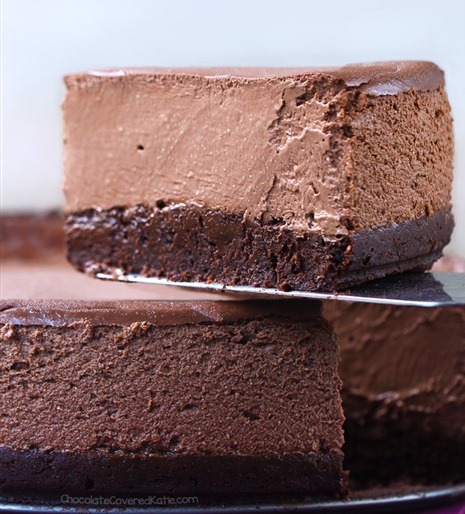 And trust me, you’re going to want to keep them all to yourself – they are so soft and gooey, with rich chocolate in each seductive bite. You also don’t have to compete with Blake Lively for their affection, which is good because it would be kind of impossible, because she’s kind of perfect. 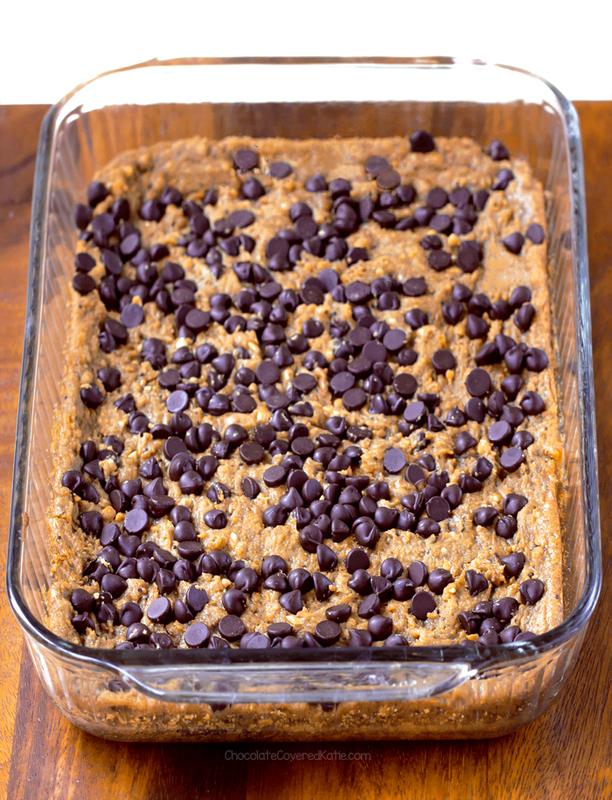 The recipe was adapted from my Chocolate Chip Peanut Butter Bars, only these make a much larger batch, and the amount of sugar has almost been cut in half… yet they are still somehow just as good! Of course there’s a video too, because there had to be a video. You need to see the blondie-making in action. Call them whatever you’d like, but definitely be sure that you try these blondies! The bars are or can be egg-free, dairy-free, vegan, gluten-free, paleo, keto, and refined-sugar-free. If you need them to be nut-free, just swap out the peanut butter for your favorite allergy-friendly alternative, such as sunflower butter or pumpkin seed butter. If you make them, feel free to tag me on Instagram, @ChocolateCoveredKatie, so I can see and like your photos! 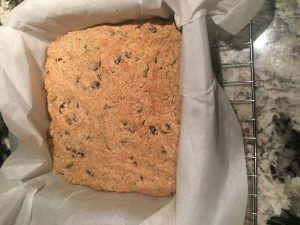 Preheat oven to 350 F. Line a 9×13 pan with parchment. Stir together all ingredients to form a batter (see the video above if you want to watch the bars being made). Add milk of choice to achieve a cookie-dough-like batter – the amount needed will depend on the flour and type of nut butter you use. Smooth batter into the pan. If desired, press more chocolate chips on top. Bake 15-20 minutes on the center rack. They’ll look way underdone – let them cool for at least an hour, during which time they firm up, and they firm up even more overnight (covered loosely on the counter). 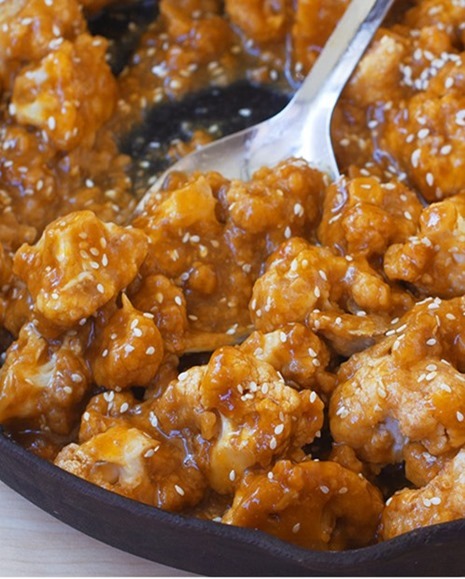 I feel like this last recipe is ALWAYS trending… but for good reason! It’s a huge reader favorite! These look outrageous in a good way!!! Blondies are still my favorite dessert and can’t wait to try this version! What makes blondies BLONDIES? I kind of wonder why we call them that! My guess, brownies are brown, so blondies are blonde, the do both have similar textures! ? I’m with you! They have the same dense texture and are a bar like brownies, but aren’t brown. Because there is no BROWN sugar used in making Blondie’s. I printed this out immediately and just made them! My new favorite recipe of yours. So soft, and gooey. I used almond butter, and when I pulled them out they did seem under cooked. But the longer they sit, the firmer they get. Thank you! Oh wow you are so fast! So glad you liked them!!! LOVE the title, haha! 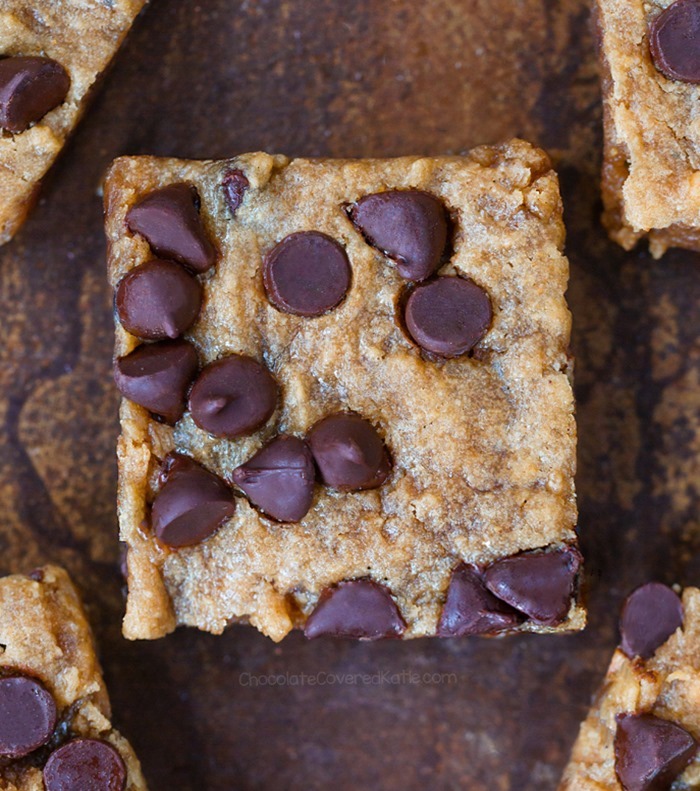 These blondies look so gooey and inviting, definitely getting pinned for later! Hello! Mine did not turn out. Maybe I missed the proportions but I thought I added everything correctly. 2c PB, .75c oat flour, .5c apple sauce, a little over .25c almond milk. I am wondering if maybe the oat flour didn’t absorb enough or something? Any ideas? I cooked an extra 5 minutes because they were VERY soft, like a mush/wiggly when shaking the pan. It tastes delicious, but more like melted peanut butter with chocolate in it. It would not hold up enough to transfer to a plate (which is not a problem for my own purposes as I’m fine eating it with a spoon! lol 🙂 ). I love the garbanzo bean blondies from your website and hope to try these again in the future! I made these last night and let them sit on the counter over night. They are still mush. Very tasty, but still not firm enough to transfer them. I put them in the fridge now and hope to see them firm up in a couple hrs. I followed all the directions but used almond flour. Again these are very yummy but hope they firm up in the fridge so they are more presentable for whom I made them for. HAHA. Hmm did you use any of the optional milk of choice? When I made them with almond flour, I don’t think I had to use any of it at all, and they were pretty firm about an hour or so after coming out of the oven. The recipe calls for 1/2 cup applesauce. I think in your post you added 5 cups??? When I was finally able to stop laughing at the cute story of how they got their name, I tried my hand at making a batch. OH MY STARS they are so good!!!! Like “I don’t know how to stop eating them” good! Can you tell me, when you list the flours, if you don’t say whole wheat, does that mean it won’t work? I don’t tend to have white flour in the house any more, but usually tend to have whole wheat! If Katie hasn’t listed a flour in a recipe, it just means she hasn’t tried that flour and so can’t vouch for the results. But in this recipe, it would probably work because the flour is only there to bind. Be sure to report back if you experiment! Unfortunately there’s really no way for Katie to know if a variation will work until she tries it. However please feel free to experiment, and be sure to report back if you do. Did you use half the amount, or the same amount? Did you use granulated and did you cut any liquid if you used a smaller amount? 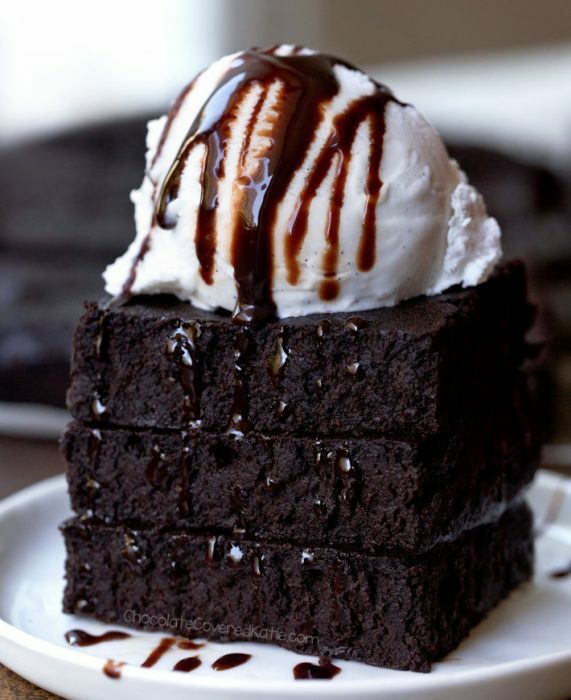 I was wondering if I could make this with almond flour and a stevia/xylitol blend. I think it depends on the specific brands of ingredients and type of milk you use and what online calculator you use. I got 102 calories per bar which is closer to Katie’s. Same here! 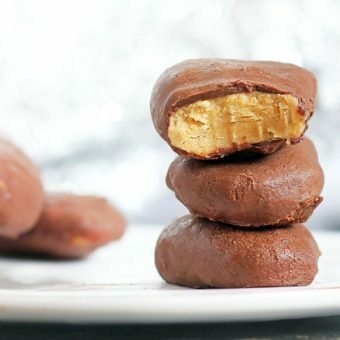 After making them and having 3, it’s kind of shocking to find out that it’s 150-160 calories each when I thought they were 90!!! Turned out really delicious though–didn’t need to add any milk. Wondering what a keto friendly alternative for the applesauce would be? Butter? Coconut oil? Sorry for the confusion – we’d thought applesauce was okay because nothing online that we found said it was strictly not okay on keto, and there were keto blogs showing applesauce recipes. But Katie says unsweetened yogurt (such as coconutmilk yogurt if vegan) will work here too. I haven’t tried butter (or a vegan butter spread) but it might also work, since applesauce is usually to replace oil or butter, so you’d think the other way around would work too, right? 🙂 If you experiment with coconut oil or butter, definitely be sure to report back! Made these tonight for my husband at his request, and with his requested changes: almond butter, spelt flour, no sweetener, and raisins instead of chocolate. I didn’t have applesauce, so I used yogurt. Used 3T of hubby’s homemade almond/coconut/cashew milk; probably should have used more, since it was firm and dry out of the oven (overbaked?). Made a half-recipe in an 8×8 pan. It is good, even without the “goodies” (sugar and chocolate), so he’s happy. 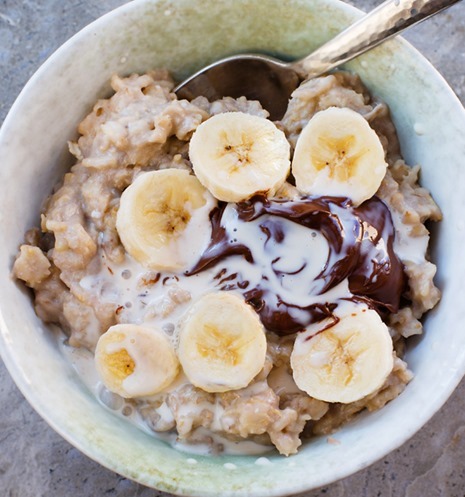 I can’t wait to make it again with the grandkids with PB, sugar, and chocolate chips!!! It will be fantastic. Thank you for another great recipe. Mine were dried out too even though I baked less. Maybe the 8×8 cause I did half in that like you. Or just bake even less? Still good – just not gooey. Now I need to make some Orlando Bloom or Joe Manganiello brownies 😉 haha, I love the story of the name of this recipe! These blondies do indeed look seductive, but they will ALL be mine! you have the best blog name! i love it! These were so good. I used powdered peanut butter mixed with water. Also I cut the recipe in one-fourth and put it in two little pans since it’s just me. They firmed up enough to eat after 20 minutes. I can see bringing these to a potluck. Love the recipe. Katie, I love the story and really enjoy films with George Clooney and Ryan Reynolds! Who can forget some sweet Orlando Bloom and Leonardo DiCaprio…and I enter my cougar years I love seeing Zac Efron! So…perhaps I made a poor peanut butter choice because I literally grabbed the ‘cheap stuff’ my husband uses in his bear bait food mix. I used oat flour. Coconut sugar, unrefined…trying to counteract the garbage peanut butter choice! LOL Last night the pan was super watery, probably oily. Today they seem to have more shape, but they look more like ice cream topping than able to cut nicely as shown in your beautiful pictures. Not that I’m complaining…nothing like a good topping to some plain ice cream! What flour thickens it a bit more, and which type peanut butter do you use? ps…I did double the recipe and cooked it in my BIG casserole pan. Thanks for always keeping me in my chocolate! I think in your case it is probably because of doubling the recipe, not a flour choice. Doubling a recipe does not always work just by doubling every ingredient. For example, Katie had to change the sugar amount, milk amount, and the baking time from her original chocolate chip peanut butter bars in order to get a good result. Katie’s tried all of the flours listed, and I’ve personally tried the oat, spelt, and a white flour version. I think my favorite was the spelt version. But the peanut butter should not matter either. In any case I think your photo looks delicious! Hmm.. I made these with Oat flour, half the sugar in the form of honey and coconut oil because I didn’t have apple sauce. Milk was not needed because of the liquid substitutes, but I would say that the peanut butter to flour ration is very off – they are GOO-EY. Basically just peanut butter mixed with sugar! They’ve been sitting out for 3 hours and haven’t settled anymore, hopefully they will firm up the longer they stick but if I make these again I would definitely add more flour. I am not trying to be rude, but I am amazed by this comment. It’s thanks to your substitution that the recipe didn’t work, and it isn’t Katie’s fault. As long as you’re okay with the possibility of an unexpected result, feel free to make substitutions with any of Katie’s recipes. But if you want to not risk it, it’s always best to try the recipe as written, at least the first time so that you can see how they’re supposed to turn out. Hopefully your bars still taste good! 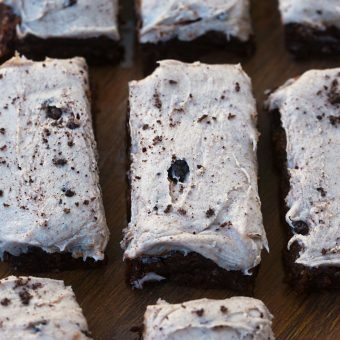 Thank you so much for this recipe Katie! these are so good! i cut the recipe in half and it worked perfectly. 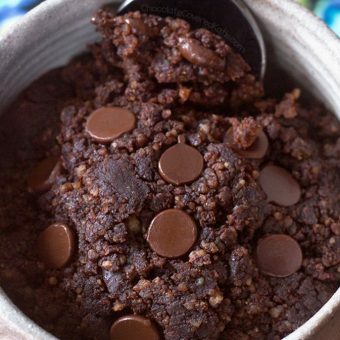 some things i will do differently next time…i will use mini chocolate chips and i think they would still taste really good if i cut the amount of sugar. thank you for another great dessert!